The Mangrove Steelband is one of the most prominent in Europe. Formed in 1980 from a ‘Pan Round Neck’ group of the traditional type we have established ourselves as a fully-fledged modern orchestra. With an enormous following of supporters we are one of the largest/most travelled and most professional Steelbands in Britain. Eight times winners of Panorama, the UK’s National Steel pan competition. 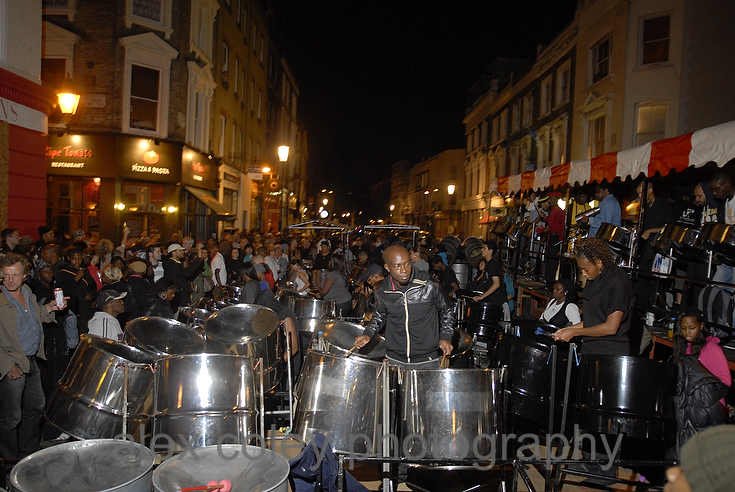 The band was born out of the vision and determination of Trinidadian’s living in the Notting Hill area in a quest to introduce the culture of Steelband and Carnival to the local youths of their community, thus ensuring the Caribbean art forms were handed down from generation to generation. A core element of twenty dedicated players rehearse and perform all year round. During the summer months this figure swells to Eighty members as the band prepares to participate in the London Notting Hill Carnival and the UK’s prestigious Steelband competition – Panorama. A competition at which the band has experienced an immense amount of success, winning on eight occasions.